How do falling share prices affect the economy? Lower share prices mean investors will see a fall in wealth. However, this is unlikely to influence consumption significantly. Most people who buy shares are relatively affluent; if their stocks decrease in value it doesn’t mean their consumption will suffer. Usually, people who buy shares see it as speculative investment. Nevertheless, if the fall in shares is prolonged it will have a small effect in reducing consumer spending. In the long term, lower share prices will harm investment trusts and pension funds. This could leave people with lower pension payouts. However, this is very much a long term factor. More difficult to raise finance for investment. Some firms use the stock market as a way to raise finance for investment. If share prices fall, it will be more difficult to raise equity through share issues and so it could reduce investment. However, this is only a relatively small influence on investment levels. Confidence factor. Falling shares may weaken consumer and business confidence; it reinforces the economic turmoil and may make them reluctant to spend and invest. This shows the FTSE-100 share index. The stock market crash of 1987 – had little effect on the economy. 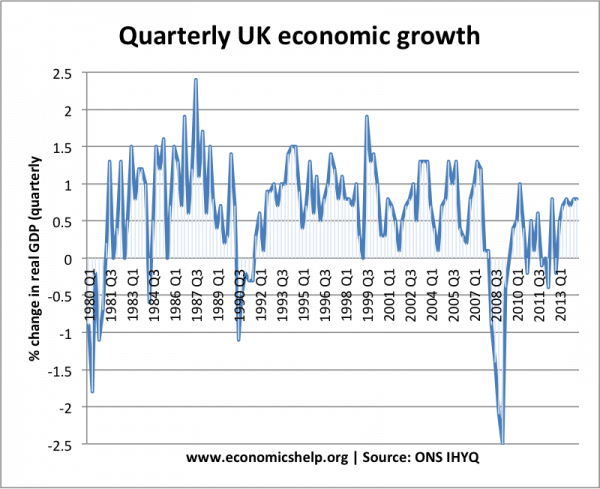 In fact, the government cut interest rates as a result, and this helped accelerate the boom in the UK economy. The economy grew very quickly in the last 1980s, before leading to inflation and the recession of 1991. In the period 2000 to 2003, there was a sustained bear market, with prices falling over 30%, however, this period was of sustained economic growth and low inflation. The next big fall was in 2008 and 2009, this was a reaction to the global credit crunch and recession of 2008/09. It wasn’t the fall in share prices which caused the recession. It was the credit crunch which led to lower share prices. In 1929, the Wall Street Crash was an important factor in causing the great depression. The problem was that in the late 1920s, many had bought shares ‘on the margin’ – effectively borrowing against expectations of rising prices. When share prices fell significantly, many people became bankrupt and banks also lost a lot of money. This was one of the factors causing the great depression. Falling share prices are often a reflection of a weakening economy.. It is not the share prices that are causing the economy to go down. How does stock market effect economy?